I just wanted to take a moment to discuss an exciting project I've been working on for quite some time now that's just been completed. 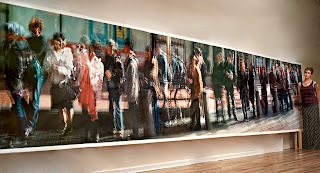 Recently I became connected with an amazing art advisor, Patti Gilford. She helps to acquire art for private homes, and for designers and architects who are looking to build creative, inspiring, and soothing environments. Patti explained to me that she was looking to obtain pieces for a shared space on the 12th floor of a new hi-rise residency on Lake Shore Drive. This specific space is pretty open and needed a nice flow and a central focus. She had seen the work on my website and thought I'd be a good fit for this project. Immediately, Chelsea and I started looking through my body of work, which is no small feat. We narrowed the our sample images down to pieces that contained people, moving across a landscape. Below is an image of the two pictures that Patti chose, in their final destination. It was fun for Chelsea and I to be a part of this building's design process. I think it's important for people to be surrounded by art in their living spaces. The places we call home are our sanctuaries, where we can unwind, reflect, and recharge. Sometimes we need aid in doing so and art can play a major part in this process. 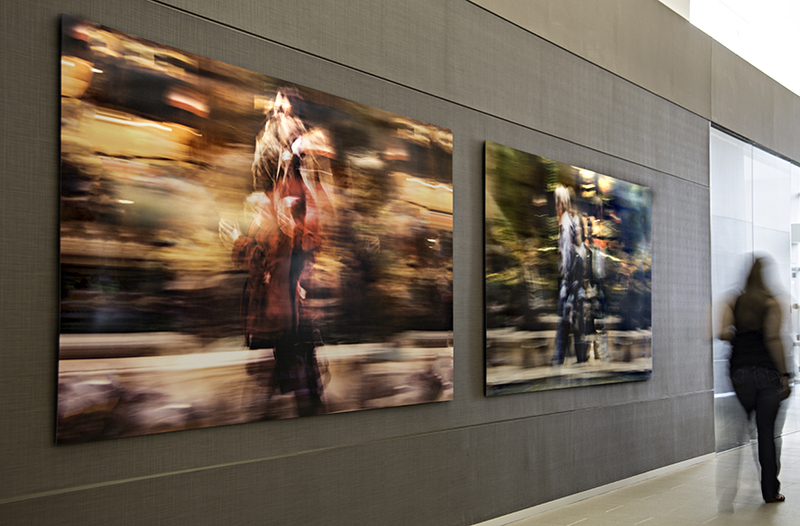 My pictures were placed in an open space where people pass by to get to the main amenities of the building such as a gym, pool, party rooms, and computer labs; places meant to make you feel at home. The space needed images that would make an impact on its inhabitants, which is why they were printed so large, as most of my pieces are. My hope is that my work has become a staple of this shared space, that people pass by it with intrigue and comfort. 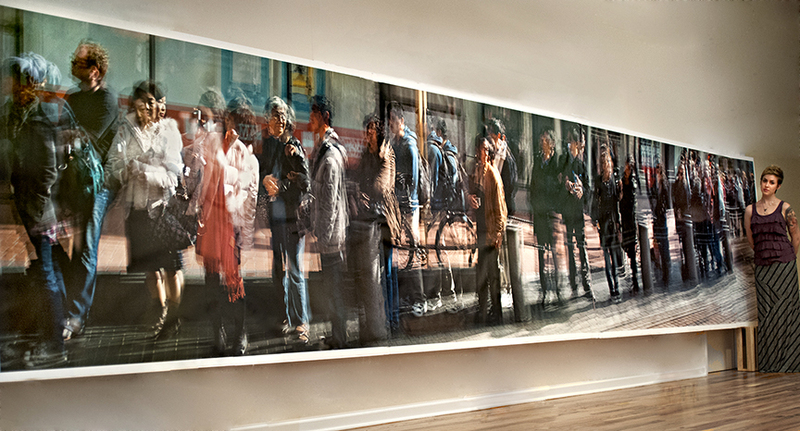 I have included an image of another piece of work, a panorama, that is intended to make a similar impact. Also, check out Patti's website at www.pattigilford.com to see what her and her excellent firm are all about. This month's artist is a musician. I was trying to think of an artist that inspires both Darryll and I, not just in our artwork but also when we're working in the studio. We are always listening to music in the studio and sharing with each other musical artists that we dig. One day I showed up to work and Darryll had burned two CDs for me. One was Feist's latest album and the other was Zoe Keating, an artist I hadn't heard of before. 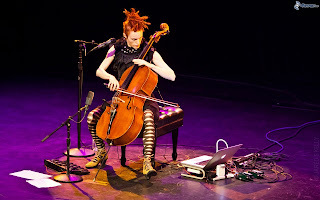 All he explained to me was that she plays the cello and that it's kind of different but I might like it. Done! I put the CD in my car on the way home and instantly was transported to somewhere new. The sound coming from my speakers was intricate, dramatic, and soothing. I knew right away that this would not be kept in the CD graveyard within my car instead would make it to my laptop's music library to be listened to while I work. I think what I love most about Zoe's music is that my mind can wander within it. I'm not distracted by words and choruses, but instead lulled into a space where I can create and think alongside her music. I also think that Darryll likes her music for similar reasons but mostly because her music is so layered. 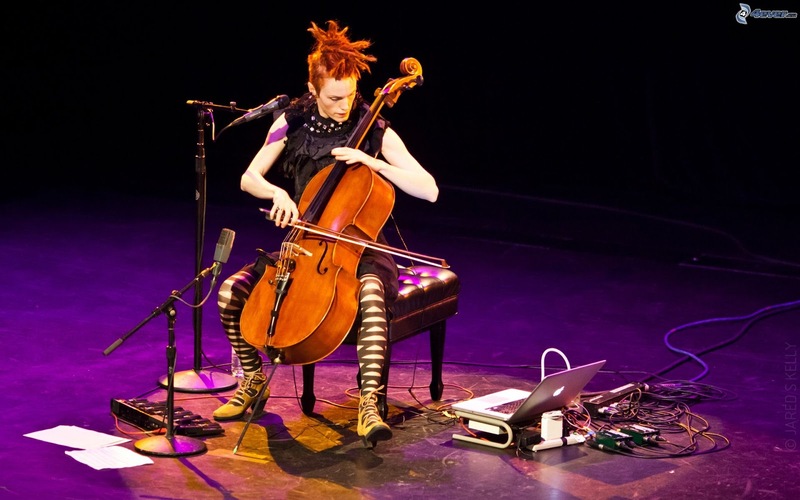 She plays with just her cello and laptop, which she uses to record samples as she plays, and layers them on top of each other. If you take a look at Darryll's photography, he is using a similar technique. They both have a sense of controlled chaos in their work, that evolves and expands as you begin to notice the small details that make up the bigger picture. Give her music a listen and see what you find within it, and within yourself!